By Mike Ryan, January 24, 2010 in Plugins - Publishing ONLY! Yes, there are about ten million plugins that already perform certain portions of this effect, but trust me I wouldn't publish it if I didn't think somebody would have a use for it! I wrote this out of frustration with Illnab's new version of Alpha Mask. Yes, the Copy from Clipboard function was incredibly useful, however it no longer rendered a B&W copy of the layer if no file was selected. So here is my plugin, which does just that and a little bit more. It generates a B&W copy of the layer then applies it as an alpha mask. You can invert the mask, blend it with the current alpha, and then I threw in some extra settings that I often need. 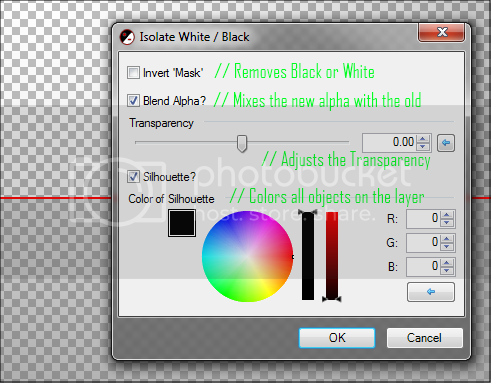 In the old days, after running Alpha Mask 'blanked' I would find myself opening up BoltBait's Transparency plugin and my Silhouette plugin to make some final adjustments. As you can tell, that functionality is incorporated for ease of use. I thank Illnab for providing the old source code, and BoltBait for the concept behind Transparency. Enjoy! Thanks a lot! I'm definitely going to use this one. Do we have to install the CS file as well as the dll file ? Goon, the CS file is the plugin source code, if I'm not mistaken. Just the DLL is needed.